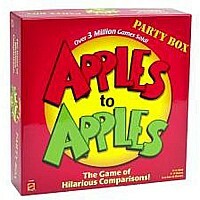 Apples to Apples Party Box the Game of Hilarious Comparisons! This award-winning party game contains over 1,000 cards for hours of entertaining play! Each round is filled with surprising and outrageous comparisons from a wide range of people, places, things, and events. For ages 12+.